"Lavender" Collection evokes that feeling of a soft and luscious field of beautiful flowers....the sights, the smells and the delights! The gorgeous background papers and elements in this kit let you create cards, mini albums and scrapbook layouts for nearly any occasion. Friendship, wedding, anniversary, graduation and so much more will fill your thoughts with inspiration. 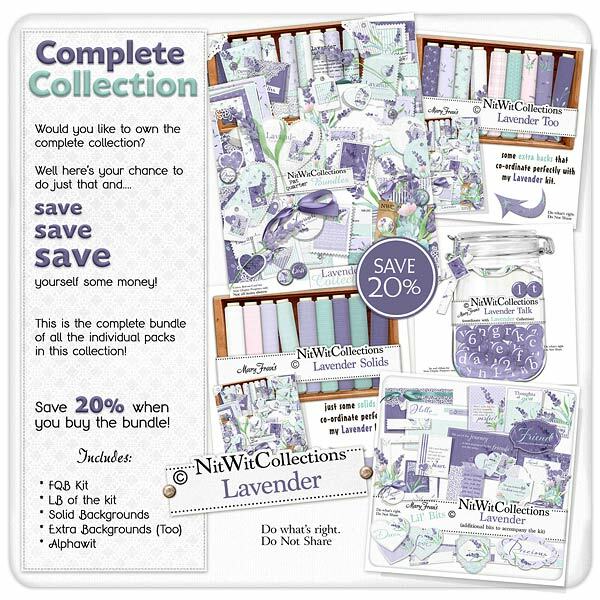 Lavender sachets, lace borders, diamond centred ribbons, and wonderfully clustered lavender sprigs are just a taste of what this digital kit offers. Let your eyes take it all in and carry you away to a peaceful place of creativity....you'll love it!